Malajum (seated second right) together with (from right) Peter, Nansian and Hon in a group photo with participants of the workshop. KUCHING: Tougher, harsher and mandatory sentences for environment-related offences are making their way through the legal system; that could send a person to jail for even discarding litter out of the car window. Thus, Chief Judge of Sabah and Sarawak Tan Sri Panglima Richard Malajum urged the public to change their irresponsible attitudes towards the environment and not to take the law lightly. “People are treating this infringement like minor traffic offences, thinking paying the fine would settle it,” he said in his address at the ‘Environmental Protection In Sarawak – The Way Forward’ workshop held at the Malaysia Tax Academy Kuching, Jalan Tabuan here yesterday. Now, offenders found guilty for possession of wild meat, protected species or animals, Malajum warned, will not be slapped with just a fine but serve time from between six months to one year in jail. “And very soon, if you throw rubbish out of the car window, you are going to prison. This is what I am pushing for because we realised that if we don’t do it the hard way, no one will listen,” he said. “It is only a matter of time now to see to it that the court acts strictly on environmental cases,” he added, highlighting that this will be a wake-up call for all citizens to be more civic-minded. 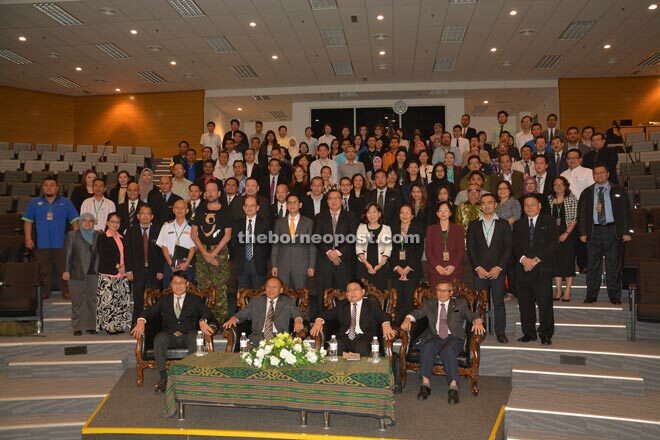 This first workshop out of a few series planned was organised by the High Court of Sabah and Sarawak to create awareness among court judges, judicial officers and personnel of enforcement agencies of how to handle cases relating to environmental issues. The High Court of Sabah and Sarawak took the lead to deal with environmental issues together with Natural Resources and Environment Board (NREB) Sarawak and World Wide Fund for Nature (WWF) Malaysia. With the enhanced legal policy for environmental protection in place now especially in Sabah, he revealed that two offenders had been sentenced to 30 months’ imprisonment for possession of wildlife meat. “It is not a one or two days’ imprisonment but you are looking at years behind bars possibly,” he said. However, Malajum wanted to see an even heavier punishment imposed in order to send a strong message to deter the public from committing the crimes. He shared that the earth was now on the brink of its sixth mass extinction, in which according to scientists, the human race could be wiped out for their own faults and not due to natural phenomenon. “The earth could even become a desert for a long time,” he said. “There will be no escape unless we do something about it. If we are not careful with our actions today, we will suffer the consequences later in the future,” he added. Speaking of environment, Malajum explained that it implies not only the physical surrounding but the flora and fauna, wildlife, marine life, including the indigenous people who are very much part of the land they live in but have been disregarded. The second workshop, he said, will focus on capacity building by providing training for investigative officers (IO) and prosecuting officers (PO) on handling investigations, finding concrete evidence, better understanding of court procedures involved as well as to enhance relationships between the court and enforcement agencies. He revealed a strange discovery that not a single case of illegal logging in Sarawak had been filed in court from 2014 until today. “This cannot be right, if so the chief minister (Datuk Patinggi Tan Sri Adenan Satem) would not be shouting and running around,” he said. “I suspect it could be because offenders are just served with compound instead of being charged in court,” he added. Malajum however pointed out that there was nothing to be alarmed over yet as such shortcomings would be addressed in the third workshop that would emphasise on reviewing and enhancing the present laws. “Things have changed and the laws needed to be updated to meet current situations,” he said. “We will review the laws to see through any weaknesses and shortcomings and improve them so as to implement an effective legal framework,” he added. He also stressed the importance of upgrading the laws, noting that Malaysia was a hub of wildlife trafficking. “This is why this first workshop is crucial to build up the awareness about the environmental issues we faced and how the environmental damages done could affect humans and other life forms,” he said. “The media should not be shy but do more in highlighting and exposing environmental issues and problems so as to educate the public and in turn encourage on protecting and conserving the environment,” he added. Malajum urged participants attending the workshop to be frank, honest and brave in speaking up and ask questions to address the issues concerned. Assistant Community Services Minister Datuk Peter Nansian, NREB controller Peter Sawal and WWF Malaysia Sarawak programme leader Dr Jason Hon were present.